e-Fuel uses a proven combination of maltodextrin (complex carbohydrate) and fructose, which research has consistently shown to increases carbohydrate transport and total available energy compared to products like Hammer HEED without fructose. For additional details read this article. If you’re not familiar with xylitol, take a moment to do your own research on this sugar substitute. You will quickly find that xylitol is well documented to cause intestinal gas and diarrhea. That alone should be enough to concern any athlete, but it gets worse. According to WebMD there are concerns that long term use (more than 3 years) may cause tumors and they recommend that pregnant or breast-feeding women not use xylitol. Additional warning, even in small amounts xylitol is extremely toxic to dogs. Just a little won’t hurt me, right? Hammer does not disclose how much xylitol is in Hammer HEED, but if you look at the list of ingredients, xylitol is the second ingredient on the list. Further more, if you’re like most athletes, you use more than one bottle during each workout or competition. If you’re having any stomach discomfort with Hammer Heed, it may be being caused by the xylitol. According to WebMD: Stevia and chemicals contained in stevia, including stevioside and rebaudioside A, can cause bloating or nausea. Other people have reported feelings of dizziness, muscle pain, and numbness. 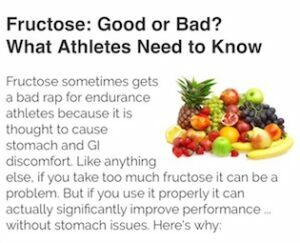 Using ingredients that cause stomach distress is the last thing that an athlete would want to deal with, so none of these ingredients are found in e-Fuel or e-Gel. Ironically, Hammer HEED stands for “Hydrating Energy Electrolyte Drink“, and yet the product has virtually no electrolytes. When using HEED, Hammer recommends using their electrolyte supplement product (Endurolytes). However, this is just one more thing to buy, one more thing to transport and figure how and how often to consume. With e-Fuel there is no need to use an electrolyte supplement, everything you need is already in the drink. A 24 ounce bottle of Hammer HEED contains only 60 mg of sodium when using the recommended 1 scoop per 16 oz (or 100mg when mixed at maximum recommended concentration). On the other hand, a 24 ounce bottle of e-Fuel Endurance Blend contains 450 mg of sodium for complete and balanced electrolyte replacement. Citrates assist in the carbohydrate to energy conversion process as well as reduce and slow the build-up of lactic acid in your muscles. Hammer HEED does not have the citrates found in e-Fuel. Hammer HEED does not have the antioxidants found in e-Fuel.